It's an opportunity for brands to engage consumers when it matters most, according to research from Sprout Social. Ever since diamonds became "forever," branding life milestones has been a favorite strategy for firms seeking to cement an emotional connection with their customers. But it’s never been quite as easy—or as easy to screw up—as it is now, with social media sharing offering endless opportunities to make personal turning points into selling points. A new study from Sprout Social shows just how primed consumers are to incorporate their favorite brands into their biggest moments. Of all the methods to share a milestone, social topped the list, with 79 percent of respondents saying they’d use a social platform to talk about a life event. In-person communication came in second, at 74 percent. And 30 percent of consumers said they would consider mentioning a brand in a post about a milestone. It’s an opportunity any brand can take advantage of, even ones that might seem counterintuitive. "The key to finding relevance for your brand is tapping into what experiences you’re enabling," said Sprout Social Director of Content Lizz Kannenberg. "A cleaning product may not feel like the most emotional of offerings, but think about someone who’s moving into a brand new home. When they invite their friends over for a housewarming, how are they going to prepare? They’re going to make sure their new house is as sparkling and spectacular as possible." According to the study, it’s not unlikely that person would mention brands in an Instagram post about their new apartment. 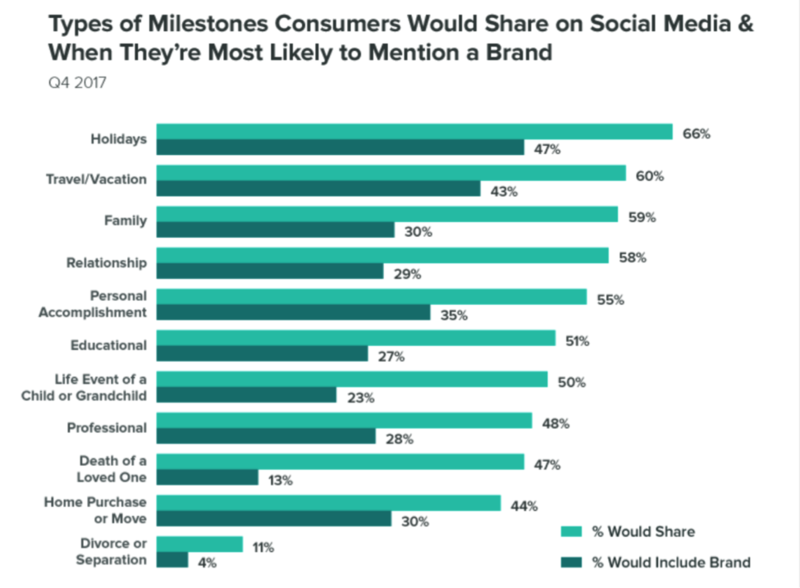 The survey interviewed more than 1,200 respondents and yielded data about when and why consumers share milestones on social, how they engage with brands, which platforms they’re most likely to use for milestone conversations and which milestones they tend to share most often about. Overall, the report demonstrates that milestones are an excellent opportunity for brands to form lasting, meaningful relationships with consumers—particularly if they’ve already demonstrated a willingness to take a stance on social issues that resonate with consumers, which builds positive brand associations that may lead to organic engagement. Just be sure to do it the right way, cautions Kannenberg: "One of the biggest mistakes a brand can make is miscalculating relevance and inserting themselves in the wrong conversation—or joining the conversation in a forced, inauthentic way." In developing social campaigns around milestones, brands also need to remember that user-generated content is a two-way relationship: when consumers share their lives with brands, especially in emotional situations, they expect recognition or reward in return. 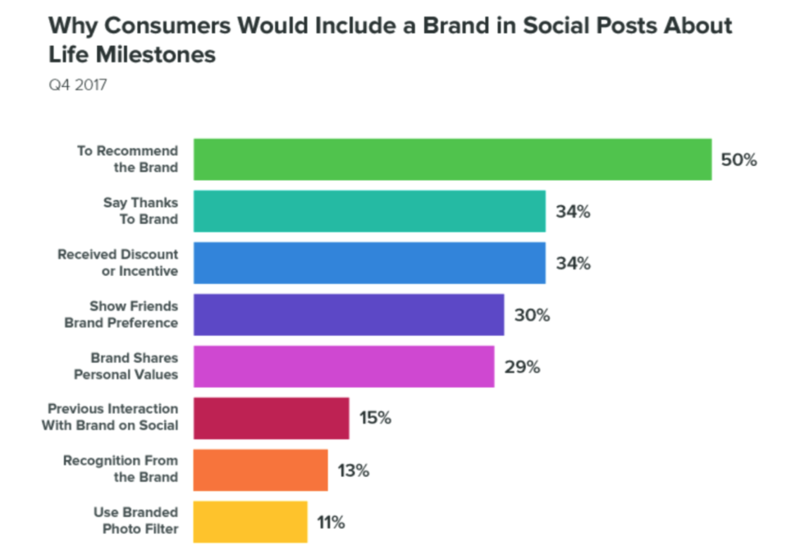 While 45 percent of study respondents said they would share mostly because of a promised discount or other financial reward, just as many said simply a like or comment on their post would be enough reciprocity from a brand. That’s a low bar, and one that brands can’t afford to over-promise on if they launch a UGC campaign. "Running a campaign that encourages engagement, then fails to deliver on that promise, sends a strongly negative message," said Kannenberg. "You wouldn’t invite someone into a brick-and-mortar store for a sale, then ignore them when they opened the door." Of course, the best UGC campaigns aren’t campaigns at all—they’re the times that a customer is so moved by their experience with a brand that they share their excitement without the brand asking them to. And luckily for brands, the generation that’s now coming of purchasing age is primed for this kind of engagement. Over and over, the study found that millennials are a natural fit for UGC campaigns. They’re much more invested in using social to tell their story and be acknowledged by their communities than older generations are. They’re also 48 percent more likely to include a brand in a post, and 41 percent of them would do so specifically to thank or recognize the brand. Kannenberg says brands shouldn’t let this opportunity slip away. "Brands that actively build a social connection with their millennial customers can encourage and reinforce this behavior when it’s time for consumers to go from being purchasers to being recommenders—something that shifts in a substantial way when they go through a major milestone like buying a new home or getting married."